The Dark Side of the "Smart City"
The "smart city" is a futurist's dream town. It's carbon neutral because computers regulate its energy use perfectly. It has no traffic jams because sensors capture real-time data on the roads and guide drivers to optimal routes. Other sensors can quickly alert police to crime, or send information to your mobile about cool events. But living in a smart city could be a nightmare. 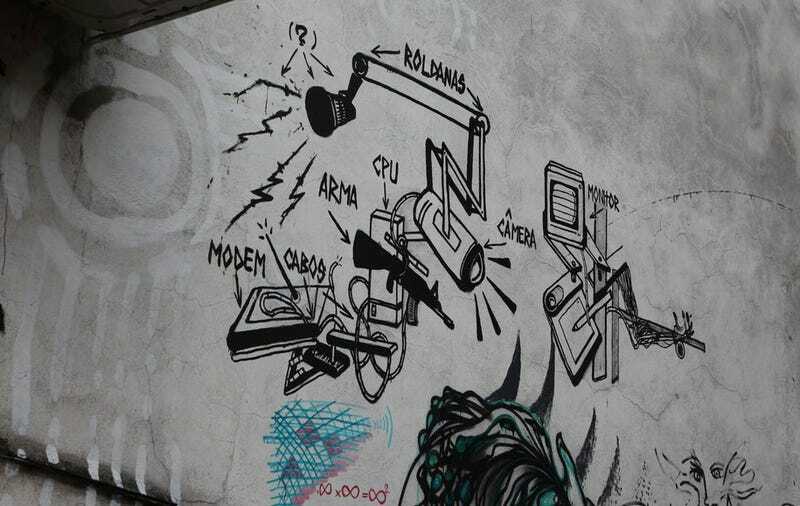 Photo of graffiti in Rio de Janeiro by Paul Keller. If you want to know where the idea of the smart city came from, you have to look at advertising brochures from IT giants like IBM and Cisco. About a decade ago, these companies wanted to figure out how they could turn their computer networking products into something that made sense in physical space. Essentially, they were wondering how they could start selling networking devices to cities, governments, and even consumers — not to connect their computer devices, but to connect the physical objects around them. They were, in essence, trying to figure out how to monetize what is now often called "the internet of things." Out of those early brainstorms at large companies emerged the idea of a smart city, where buildings, cars, infrastructure, and public utilities would all be networked. They could be easily regulated and controlled with a "city operating system" that could figure out where power was needed and wasn't in the city — or where police were needed and they weren't. Most of all, this city would be a data-gathering machine. Sensors would adhere to every surface, monitoring air quality, foot traffic, crime, water use, and even how many insects were flying around. Smart phones would be one of the most important sensors of all, as they would track the activities of every person in the city. Once Cisco or another company had enough of that data, they could use algorithms to optimize everything in the city, routing traffic, stationing police officers — or planting trees to draw insects away from schoolyards. Eventually this data could even be used to drive city government, generating information about what citizens need before they even realized they needed it. It all sounds lovely in theory, and the idea has now leapfrogged out of the corporate R&D zone, into academic research and enthusiastic pop science books. There are even smart cities being built, with help from Cisco, like Songdo in South Korea. The problem is that making a city "smart" could also crush everything that makes it a city, argues urban studies expert Adam Greenfield in a new pamphlet called "Against the Smart City." A former designer for Nokia and professor at NYU's design school, Greenfield has written extensively about urban life and technology. He believes that cities have a logic all their own, which is based on chaos and diversity. Making them "smart," and subjecting their citizens to the logic of algorithms, could be more like authoritarianism than freedom. Though the idea of a smart city is appealing, it's crucial to keep Greenfield's perspective in mind. He and I talked about the dark side of smart cities by email, right after Greenfield had relocated to London — one of his favorite cities — from New York. io9: Your essay is a response to advertising about smart city products, primarily from IBM, Cisco and Siemens. Why are tech companies leading the conversation about future city planning? How is that changing the way people understand cities? Adam Greenfield: In order to understand the disproportionate influence these companies have on a domain as seemingly distant from their remit as urban planning, I think we need to start from the idea that the perception of where capability resides has shifted in our culture. We live in a time when the popular imagination positions any individual who made their name and fortune in information technology — a Bill Gates, a Steve Jobs, a Jeff Bezos, or even, latterly, a Mike Bloomberg, a Marissa Mayer or a Mark Zuckerberg — as some kind of universal genius, capable of speaking meaningfully to just about any domain of human endeavor, and the enterprises they founded as being capable of productive intervention in just about any state of affairs you care to mention. This is why Bill Gates's opinions on family planning in the Global South are taken seriously, and nobody bats an eyelash when a company whose best-known and most widely-used product is a search engine proposes to intervene in automotive design. That's just where all the grandeur has come to reside in our age, and inevitably a tremendous share of the capital as well. So when a municipal governing body finds itself confronting the kind of wickedly complicated, multidimensional challenge that any real city generates on a routine basis, it's natural (or "natural") that it would turn for help to the institutions that appear to have all the answers. The enterprises you mention just organically have a better grasp of the specifically information-technological possibilities cities and city governments now have available to them. So they're well-positioned to profit from the general sense abroad in our culture that whatever the domain, problems that have bedeviled people for decades or even centuries will readily yield to the application of insight founded in these technologies. And while I don't, myself, think that sense is entirely misguided, I definitely don't think that an IBM or Cisco is ever going to have anything like the whole picture, either. To them, the city's just another terrain for business operations; they're inevitably (and, if you're a shareholder, maybe even properly) oriented toward selling the products and services they already know how to sell, and the systems they propose to deploy are no different than those one might use to manage any other large, complex organization. As far as I'm concerned, they completely miss most of the salient, defining features of urban life in doing so. io9: Do you think there are aspects of city life that every city shares, no matter where it is in time or place? What are they? AG: I do, yeah. I think they mostly have to do with personality — with the kind of affect, subjectivity or sensibility the act of living in a great city reliably seems to produce in people. Negotiating the circumstances of everyday life in any true city tends over time to create a broad-minded, feisty, opinionated personality type we'd have no problem recognizing, wherever and whenever it appears in human history. City people may well be tolerant of diversity not out of any personal commitment to a utopian politics, but because that's just what the daily necessity of living cheek-by-jowl with people who are different imposes upon you. City people are possessed of a hard-earned savoir faire; they know how to operate. They're not easy to cow, to snow, to take advantage of or to dominate. They like to believe, anyway, that they think for themselves. From what I can tell, this is so across cultures and centuries both. It's this kind of personality that underlies the culture, the innovation, the urban productivity economists like Richard Florida and Ed Glaeser seem so transfixed by. And yet it's just this set of characteristics that so many smart-city provisions seem hellbent on undermining, or even eradicating. The ability to search the space of the city for the perfectly congenial set of circumstances, to tune the environment until we never have to leave the contours of our own comfort: where the making of citydwellers and citizens is concerned, that's a bug, not a feature. It erodes the development of savoir faire; it eliminates the risk, but also everything wonderful, that arises in the confrontation with difference. It seems bound to produce self-absorbed, self-centered people, trapped in a foam of epistemic bubbles, each unable to communicate meaningfully with all of the others, acknowledge the validity of anyone else's prerogatives, or even stipulate the basic humanity of the others who happen to share the space and time of the city. And at the limit, the technical capability to bring the environment under arbitrarily finely-grained personal control ultimately means each of those bubbles is the size of a single individual. I obviously can't speak for anyone else, but I sure don't want to live in a densely packed hive of ten or twelve or twenty million such individuals. io9: You argue that there are elements of the smart city idea that are already creeping into our everyday urban lives without most of us realizing it. Can you talk about what these elements are, and why some of them are dangerous? AG: Well, the first and most obvious to me is the emphasis placed on quantification in the smart-city discourse — the idea that something doesn't exist, or has no meaning, unless it can be measured. As it happens, I believe that the qualities most of us cherish about urban life just aren't susceptible to direct measurement, whether that's the pleasure of the "sidewalk ballet," the thrill of discovering something secret, the solidarity when times are rough or the tacit understanding that neighbors help each other when the chips are down. You may be able to infer the presence of these from metrics you can actually garner from a distributed net of sensors, but in themselves they're just not the kind of indices that show up on a wallscreen dashboard in City Hall. So I worry that we'll undervalue precisely those qualities that are the most important to us, and the most definitive of metropolitan experience, because they can't be harvested from a camera, an accelerometer, a load cell, a GPS trace or some other order of machinic perception. The next concern I have is a sentiment you overwhelmingly encounter in smart-city advocates, which is that the act of quantification is somehow neutral — that there somehow haven't been deeply interested decisions made about how, when and where to collect data, using what means, or how it's labeled, characterized, represented and made use of, that color its interpretation profoundly. I mean, I actually heard a very senior scientist at IBM say, in so many words, "The data is the data," perfect, serene and eternal, at which his colleagues nodded sagely. I confess that I have a hard time understanding how any adult could believe that, let alone an incredibly bright and accomplished adult whose job it was to build systems capable of acting on collected data. But there it is. It's inexplicable to me. My third beef is something I've already alluded to, the belief inherent to a product like IBM's Intelligent Operations Center that municipal administration is a straightforward matter of triggering stereotyped, preformulated protocols in response to the fluctuation of key performance indicators. You might be able to run a small commercial enterprise that way, or a battalion-sized military unit — some organization where there's a relatively clear and uncomplicated chain of command and accountability, and a single, overridingly shared mission. But a city? Come on. Any city, at least in a nonauthoritarian society, is a roiling cauldron of contestation, in which a million constituencies, with profoundly different conceptions of the right, the just and the good — constituencies, mind you, which are themselves in a constant, ongoing process of coherence and decoherence — jockey for access to spatial, budgetary, attentional and other resources, and it's impossible to satisfy them all simultaneously. And that's true even in principle. There are and will be no Pareto-optimal solutions to the city. Cities are inherently tragic. So, again, it's inexplicable to me that you would even for half a heartbeat entertain the idea that a city can or should be managed like a top-down, hierarchical, command-and-control organization. Finally, there's a sense that hovers over the more recent "urban science" work, that it very definitely shares with the smart-city rhetoric, that a city is in some sense algorithmic — that all its perceptible operations are little more than the shadow cast in four dimensions by an equation or set of equations that persist in some eternal Platonic hyperspace, and that if we could but wrap our head around these equations we'd be able to intervene in urban affairs more or less as we chose to. That however blindly we'd been feeling our way through the dark, we'd at long last stumbled onto the royal levers that govern systemic behavior, and found them numeric. This mindset feels pernicious to me because the state of affairs it implies is so profoundly corrosive of our sense of agency, whether individual or collective. I'm not saying that systemic approaches to things aren't useful, and potentially hugely and irreplaceably so. Nor am I afraid of whatever uncomfortable truths might be waiting for us in future explorations of the Big Set. But even so profoundly cybernetic a thinker as Stafford Beer placed the greatest stock in our ability to choose among the futures available to us. I think it's just disappointing that the parties currently carrying on this work seem to so badly misunderstand what cities are, what they do and what they're for. io9: You contrast the corporate vision of the smart city with the idea of an open city that is heterogeneous, and whose citizens participate in creating an "emergent order." I love the moment toward the end of your essay where you talk about a city that uses information gathering to empower citizens, inform political debate, and improve the city. What does this open city look like, and what kind of government does it have? AG: I mean, "Against the Smart City" was essentially hygienic, right? It just felt necessary to clear the table, sweep these fatally flawed and shallow and ultimately antidemocratic smart-city visions away, and open up some space for alternatives, before laying out what I think is ultimately much more interesting (to me and to everyone else), which is some kind of affirmative proposition. What is it that I do think we can achieve in our cities with sensitively-designed informational-technical tools and services? I like to tell a story about a management consultant I once saw give a talk about technology and the future of civic governance. During the Q&A after his very conventional, bullet-pointy presentation, he was asked if he thought the basic forms of democratic municipal government — elected mayors, city councils and so on — were still relevant, and would remain so. And very surprisingly to me, he said no, that there was a decent chance that due to the decentralizing and distributing effects of networked information technologies, more power would come to reside with citizens themselves, organized in something resembling a federation of autonomous local collectives. I mean, this was a very conservative, very buttoned-down guy, who worked for the most prominent name in his industry, and whether he quite knew it or not, what he was describing would have been immediately familiar to, say, the members of the anarchosyndicalist CNT union who ran the Barcelona Telephone Exchange during the first part of the Spanish Civil War. I found it fascinating that his understanding of contemporary political dynamics would lead him to any such belief. It was profoundly hopeful and encouraging. And that actually is what I believe — that if there's a tendency to universal surveillance and control latent in the design of these tools, which there unquestionably is, there's at the same time an equally strong tendency in them to the decentralization and distribution of knowledge of the world, which we can grasp hold of, reinforce and make use of if we choose to. We can use the technics of data collection, representation and actuation to reinforce the best qualities of our cities, and all the things about them that make us stronger and wiser and more capable. And that's a pretty exciting set of circumstances. io9: What is it that you love about London? AG: Oh, god. Damn near everything. The texture of it, to start with. Even though London is not in any meaningful sense any older than New York — relatively few extant buildings are any older than the Great Fire of 1666, vast swaths of the East End were bombed to rubble by the Nazis during the Blitz, and some fairly misguided "regeneration" projects have done for a lot of the rest — it's still built to the contours of a medieval street plan, and that's what furnishes the urban fabric with its enduring drama, mystery, and human scale. Every corner is, quite literally, a revelation. My sense is that they've done a better and more sensitive job here of interpolating high-quality contemporary architecture with pre-modern than in the States. I'm a sucker for the imperial pomp of Regent Street or Admiralty Arch, the scale of the Georgian and neo-Georgian squares, what you might call the voice of the public signage you encounter in the Underground and on the streets. I admire the long local history of mostly working-class resistance to oppression and authoritarianism, whose traces can be found right beneath the seemingly pacified suface of London life (and occasionally breaching it). There are any number of landmarks of personal significance to me — here's the sidestreet in Hackney where Throbbing Gristle had their Death Factory, there's the Mayfair storefront where Archigram launched "Living Cities," and that's supposedly where the infamous schoolkid's issue of Oz was put together. There's an arcane, eldritch, non-Euclidean aspect to the city that delights me, as well, on a daily basis — I mean, you're not going to find anything as weird as the mythos around the Hawksmoor churches in the States. And finally, the sense that you're swimming in a different gene pool here — you just see different faces on the bus or the sidewalk than you do in New York. It's just, in so many ways, an overflowingly generous base of operations for an urbanist and a lover of cities.